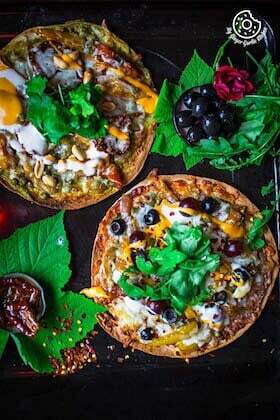 Caramelized Veggie Tortizza 2 Ways | Tortilla Pizza - These “Tortizzas” are arrays of colors and flavors on a crunchy tortilla base. They have freshly caramelized veggies, pesto and tomato base for the sauce. The addition of black olives and sun-dried tomatoes makes it a dish worth trying for sure. Oh and that mozzarella cheese — oozing down through all the sides of this perfect pizza! A good topping is what you need: Topping of crunchy roasted peanuts or purple grapes and fresh parsley or fresh arugula adds much more texture! A drizzle of garlic dressing and tomato dressing adds more flavour. Add some chili flakes as a final touch! Wow, wow, wow! A feast for the eyes and the tastebuds. Make these tortizzas and the end result is exactly as it should be, tasty and satisfying. Time for a pizza party: My family always gets overjoyed when they hear the word ‘PIZZA’. And almost every Friday calls for a pizza night in my family. Yes, we all love to celebrate a Friday evening with a beautiful looking mouth-watering pizza. However, on some Fridays when I have less energy and a little time to make my own pizza dough, then I go for tortilla base pizzas. Tortillas make a nice, crunchy pizza crust. 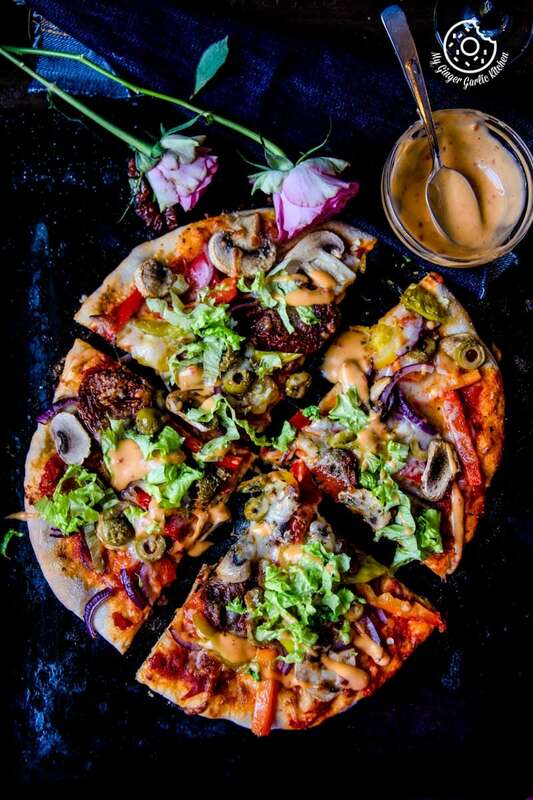 I have been making tortilla base pizzas for a couple of years now, but I don’t know why I never thought of giving it a name. May be because I always thought they are called tortilla pizza. It was during last year when I even made a joke over the name with my husband. I said to him: “See, it has a tortilla base, and it’s a pizza. So why do we call it tortilla pizza? Why shouldn’t we call it a Tortizza or something”? And he suggested: “Wow, it’s a cool (perfect to be precise) name. You should use it in some of your recipes.” But later I forgot about it completely. Tortizza, tortizza, and tortizza everywhere: Last month I saw a tortilla pizza in a vegan cookbook in a local book store. And the name of the recipe was ‘Toritizza’! I was in a blue funk for a while since the time I saw this. Oh my gosh! ‘Tortizza’ — does it really exist? That bugged me, so I googled the name tortizza, and found out that there were plenty of tortizza recipes on the web. Silly me, why didn’t I use this name earlier. ‘Tortizza’! 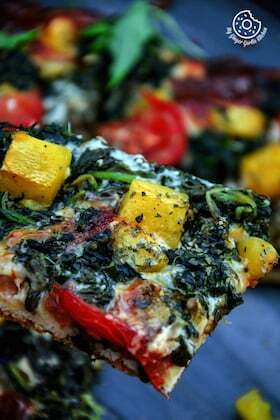 So today I am sharing a tortizza recipe and name of this recipe is — ‘Caramelized Veggie Tortizza 2 Ways’. What exactly is tortizza? It’s not quite a pizza. It’s also not really like a quesadilla. It’s somewhere in between of a quesadilla and a pizza! It’s cheesy and perfectly indulgent. In definition: The tortizza is a tortilla wrap-based pizza alternative. The result? A seriously delicious, filler meal. Assembling is super easy: Caramelize all the yummy veggies. Fill a glass of red wine. Turn on some good music. And your kitchen will be full of cheesy baking aroma before you know it! And the good news is that you can add any vegetables you like. Really anything! Weight-watching? A slice or two of this super thin crust pizza is all you need: You can still enjoy a pizza even when you are planning to lose some weight. The crust is really thin and you can choose a multigrain of corn tortilla if you like. 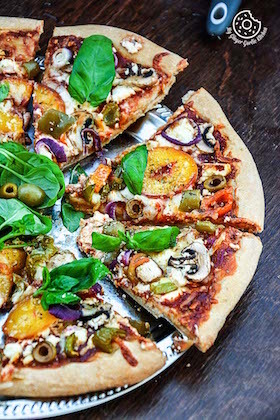 A colorful vegetarian tortizza would definitely satisfy your pizza cravings. How can you make a multi-talented tortizza? 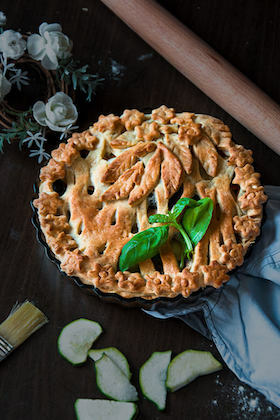 You can make them for a busy weeknight. You can make them for a weekend lunch. You can make them for a Friday pizza night. Or you can have them for a weekend breakfast. Caramelized Veggie Tortizza 2 Ways | These “Tortizzas” are arrays of colors and flavors on a crunchy tortilla base. They have freshly caramelized veggies, pesto and tomato base for the sauce.The addition of black olives and sun-dried tomatoes makes it a dish worth trying for sure. 1. Heat oil and butter in a large skillet. 2. Add onions and sauté for a minute. Add bell peppers and sauté another minute. 3. Add tomatoes, green peas and sauté for 2 mins. 4. Add vinegar and maple syrup. Season with salt and pepper to taste. Add chopped spring onions and sauté another minute. 1. Preheat oven to 180°C | 356°F. 2. Grease an oven tray with olive oil or cooking oil spray. 3. Place the 2 tortillas on the baking tray. Spread pesto on both. 4. Add a generous amount of veggies. Top with sun-dried tomatoes. 5. Sprinkle with cheese, and place into the oven (on the middle shelf). Bake for 10 minutes, or until cheese is melted and crust is brown. 6. Top with roasted peanuts. Drizzle with tomato chili and garlic dressings. Garnish with fresh parsley. Enjoy! 2. Place the 2 tortillas on the baking tray. Spread pizza sauce on both. 3. Add a generous amount of veggies. Top with sun-dried tomatoes. Sprinkle with cheese,and top with olives. 4. Bake for 10 minutes, or until cheese is melted and crust is brown. 5. Top with purple grapes. Drizzle with tomato chili and garlic dressings. 6. Sprinkle chili flakes and garnish with fresh arugula. Enjoy!